The 82nd patient of the Cryonics Institute is an 85-year-old woman who, along with her husband, has been a CI Member for several years. About four years ago she experienced a stroke. She had been cared-for at home by her husband and nursing aids until the morning of Monday, June 25th when she was taken to the emergency room of a hospital. She had been brought to the hospital because of an eating problem (difficulty opening her mouth), but in the hospital was diagnosed with pneumonia. At about 11am she was pronounced dead due to heart failure. The funeral director packed her head in ice and she was maintained in refrigeration with her head packed in ice until the time she was shipped to the Cryonics Institute. A transit permit cannot be issued for shipment out of the state in which the patient was pronounced dead until a death certificate is filed. The death certificate (completed by the funeral director) could only be signed by the patient's personal physician because an emergency room physician does not know the patient's history. The patient's personal physician was on vacation. The patient's physician was finally located and directed to authorize someone in her clinic to sign the death certificate on her behalf. But the death certificate signed by the appointed physician was rejected by the coroner's office because heart failure (listed as cause-of-death) was deemed unacceptable (in every death the heart will stop). As a result of all of the delays the death certificate was not filed and the transit (shipping) permit was not issued until Wednesday, June 27 -- two days after legal death. When the funeral director contacted his local airport for guidance about shipping in ice he was told that absolutely no water-ice would be permitted for shipment. Any ice cube discovered would result in complete refusal of shipment. Never in the history of the Cryonics Institute has this problem been encountered before. The funeral director attributed this difficulty to the personality of the person in charge of shipping at the airport. The funeral director packed 50 pounds of gel packs into the Ziegler shipping box. When we received the patient there were 13 three-pound gel packs in the Ziegler. Fifty of these gel packs (150 pounds) might have provided sufficient cooling. Ten pounds of dry ice was placed between the Ziegler and the shipping crate -- not enough to cool the patient below freezing temperature. Not enough to cool the patient much, in fact. The patient's head (nasopharyngeal) temperature was just above 10ºC. CI local funeral director Jim Walsh (assisted by his funeral director daughter Sara) began surgery at 11:35pm on Wednesday evening. The incision above the clavicle bone was not adequate to expose the right subclavian artery (as had happened with the 81st patient). With the 81st patient Mr. Walsh had reached below the clavicle to pull the vessels forward, but he apparently thought the vessels were too deep or hard to find in this case. Instead of cutting the clavicle bone, Mr. Walsh made another incision below the clavicle and carefully cleared-away tissue until he found the branching of the vertebral and carotid arteries from the subclavian. Perfusion began at 12:03am. Unlike the previous perfusions (with CI patients 79 and 81) perfusion began with m−RPS−2 rather than with 10% ethylene glycol. Evidently this was done because the patient had received no heparin or blood washout, but considering the amount of ischemic time the patient had suffered it was probably a bad choice. Her face swelled-up and was virtually sweating fluid. There was a white puffy appearance. Perfusion pressure averaged about 120mmHg, but oscillated greatly between 90mmHg and 140mmHg. Perfusion was reasonably good on the left side, but there was poor flow on the right side -- with more clots and blood. There could have been problems with clots, stroke or plugged jugular vein. Burr holes were introduced at 12:22am prior to perfusion with full strength (70%) VM−1 (Vitrification Mixture one). The patient's skull proved to be unusually thick on the left side (½−inch rather than ¼−inch) so an attempt was made to place the burr hole more toward the temple on the right side, but without improvement. When perfusion with 70% VM−1 was resumed, flow continued to be good on the left side and poor on the right side. Blood continued to be present in samples from both the right jugular and the right burr hole, unlike the left side. Brain core (nasopharyngeal) temperature dropped to as low as 6.6ºC during VM−1 perfusion, but was about 9.1ºC at the end. An attempt was made to stop perfusion on the left side and perfuse only on the right side (at 0.14 liters/minute), but this had no effect on the refractive index of fluid in the right burr hole. Perfusion was then resumed on both sides. Head perfusion was completed at 1:13am. The patient's head was placed in the plastic head enclosure, dry ice pellets were added and then isopropyl alcohol was added to create a cold, head-cooling slurry. Beginning at 1:23am the patient's body was perfused with 40% (v/v) glycerol at 0ºC. Perfusion was done downward through the carotids. After 6 liters of 40% glycerol had been perfused, 75% glycerol (0ºC) perfusion was begun at 1:40am. There was fluid accumulation in the abdomen and evidence of perfusion in the thighs and right arm (yellowing, dehydration), but not in the left arm or in the feet. Although the edema was not as bad as had been seen with ethylene glycol, perfusion was stopped at 2:09am after 6 liters had been perfused. 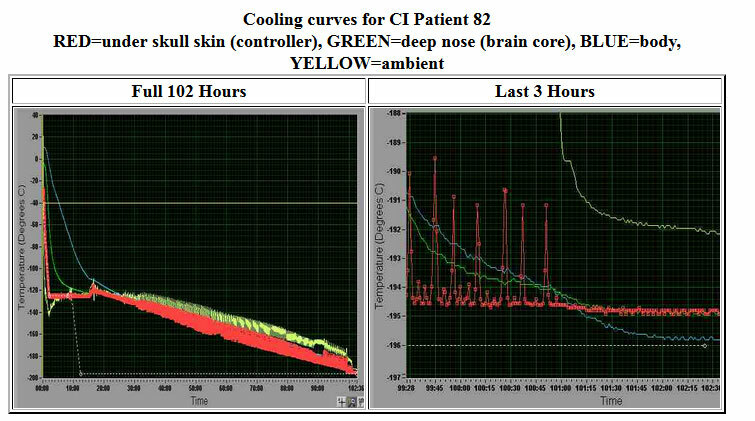 When the patient arrived at the CI Facility and was placed in the computer-controlled cooling box brain core temperature was 0ºC and brain surface temperature was −40ºC. In the cooling box, brain surface temperature initially rose (to −35ºC) while brain core temperature continued to fall (to −1ºC).I made a great attempt to automate the cooling protocol as completely as possible so that it can be done without manual intervention. Although I did intervene, I believe that I learned enough to program it enough to go without manual intervention the next time. The thermocouple in the skin above the burr hole is used as the controlling thermocouple by our LabVIEW computer control system. Cooling of vitrified tissue should be as rapid as possible to glass transition temperature (Tg) (solidification temperature), but should not go much below that temperature in the first phase. Cooling must be done quickly above solidification temperature to prevent ice formation which might occur in areas which are poorly perfused. Below solidification temperature cooling must be done very slowly to minimize cracking due to thermal stress. The cooling strategy is to cool the surface of the brain as rapidly as possible to Tg and then wait until the temperature in the center of the brain approaches Tg. Once the center of the brain is close to Tg the surface is warmed slightly in the hope that the entire brain could be of uniform temperature in a highly viscous "liquid" state just above Tg. This is not "annealing", because annealing involves warming a solid to just below melting temperature as a means to relieve thermal stress in a solid. By remaining just above Tg for the entire brain and cooling very slowly through Tg we believe we achieve the greatest temperature uniformity and the least thermal stress, while relying on the very high viscosity to prevent devitrification. I cooled the brain surface (thermocouple under the skin by the burr hole) to −125ºC and held at that temperature for about fifteen hours, which allowed the brain core temperature (nasopharyngeal thermocouple) to reach about −125ºC. Then I warmed the surface to −120ºC for one hour which allowed the surface temperature to rise above the brain core temperature. Then I cooled to −196ºC. In the last phase of cooling, body temperature (which had been higher than the brain temperatures) dropped below brain temperatures to nearly liquid nitrogen temperature (as happened in previous cases). This is probably indicative of the patient's sleeping bag being soaked with liquid nitrogen. Brain core and surface temperature flatten-out just above that temperature. The patient was removed from the cooling box still in the sleeping bag on top of the patient's plywood support board. While liquid nitrogen was periodically poured on the patient's head, the patient was tied to the board using 50 feet of three-eight-inch twisted nylon and polyester rope (as is done for all patients). The patient is also held to the board with red lashing straps. The rope is tied and knotted through holes on both ends of patient's plywood support board. Knots in the rope hold the patient to the board, hold the patient's name plates to the rope and hold the stands of the rope together. The ropes extend from the foot of the patient's board to allow the patient to be lowered, removed (rare) or moved while in liquid nitrogen in the cryostat. At 10:15am, Tuesday, July 3rd, 2007 the 82nd patient was placed in liquid nitrogen in a cryostat.